This is a funny Christmas for me. Just after it, in January my daughter is taking off traveling for months and months and months before going off to university in September. My son is already at university, and is coming home just a couple of days before Christmas because he's working. Yep, I'm facing the good old 'empty nest' syndrome. And I'm afraid I'm not taking to it very well. Of course, I want the kids to go off. It's always been part of the parenting contract for me, and I'm lucky I had them so early. Over the last years it's felt that we've grown up together as we've faced misdiagnosed illnesses, disillusionments, pressure, partying, stress, lack of stress, and all the good things too. You name it, we've had it. I certainly haven't raised paragons as children, they're normal human beings and hurrah for that. But this time of year has brought it home to me that my life isn't going to be the same any more. I love Christmas more than anything, so when I went for a walk recently and looked through lit windows, it physically hurt to see the crayon drawings up on the walls, the cartoons on the television, the climbing frames in gardens everywhere. When I'm out shopping I find myself looking at the latest must-have toy, the tiny little soft dresses and jumpers, the christmas stockings. I'm even contemplating asking to borrow a friend's kids so I can take them on the Santa express. Don't worry, I am not completely misty eyed. 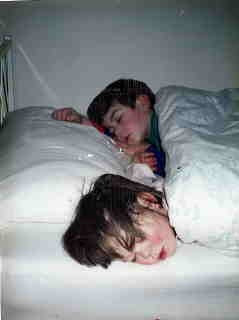 The photograph below was taken on Christmas Eve years ago, after I had spent hours and hours trying to pretend the kids that they had to go to sleep before Santa arrived. Finally, I gave up and went to pour myself a stiff whisky. When I came back, lo and behold, some Christmas magic had taken place! Yes, it's one of my favourite photographs now, but I can remember what went on around it too! And of course, I'm one of the lucky ones. In so many ways. And there's masses to look forward to. And I'm hardly going to be moping around the whole of next year. Still it does feel as if I've shifted over to another place. I can no longer put up baby buggies for instance - something I used to be furious with my mother about when she never quite managed the knack I had of unfolding a buggy with one hand in two seconds. Buckling up children in car seats makes me cry. And as for the names of all the cartoon characters ... how did I retain such a lot of useless information! I used to know them all, plus their friends. And their friends too. Actually come to think of it, there are advantages. I no longer have to partake in random exams on all the Pokemon people. Heck, I don't even have to worry about how I can't spell Pokemon. One thing I remember myself about coming home for Christmas as an adult was having to walk round the house before I could really settle down. I'd complain if a picture had been moved, if my mum hadn't cooked the rock buns she always cooked every year, if a certain decoration wasn't put up where it was always put up. I'd check what she and dad were reading, I'd look at the Christmas cards to make sure I knew who they were from. It was more than petty childishness (although it was a fair amount of that too), it was needing to know that my parents and the house would always be there if I was going to successfully take off myself. The privilege involved in this was something I wasn't aware of at the time. Sheesh, I can still remember the fuss we all made the year Mum idly wondered whether she would cook something different instead of turkey. So that's my new role. Going nowhere. Luckily for me, I have the blank page on which to really explore new territories! It all passes in a wink, doesn't it? Sometimes I worry that I'm so wrapped up in the day-to-day survival, that I forget to enjoy and savour. I wish for you many more adventures, but I especially wish for your daughter a safe and exciting journey. I would be in exactly the same situation if I hadn't remarried and started all over again with a third and then fourth child. There are lots of things about Christmas I don't like but I can't tell you how many nativities I've sat through and felt quite mushy. Neither can I count how many times I have been asked 'So what's happening at Christmas, then?' over the last few weeks. Sometimes its hard work being the family anchor! Or you could imagine yourself as the bit in the middle of a wheel and everyone else running around on the outside. It's quite exhausting even when you're not going anywhere! ll know, I'm in the same boat. It's not easy and the holidays certainly makes it harder. But a friend of mine is facing her first Xmas with her son having to go to his in-laws instead of to her. i know that day will come and I'm already dreading it, even though I know (hope) it's not for years to come. but "going nowhere"? Ooh, that doesn't sound like you. Not at all.....it's good to know we've got each other's backs though, eh? To state that your 'new role' is going nowhere is a complete and utter understatement as I find your writings extremely intriguing to say the least...Hello my name is Amy and I am a friend of the wildly awesome Rachel Smith and Giving Tree Jewelry. This post truly hit home to me. As I have three young ones myself and as much as I adore the 'patient' pace you must walk with young ones, the hustle and bustle of life can sometimes rear it's imperative 'head'. When it occurs, you can't help but have the tendency to overlook all the little 'wonders' that your children produce DAILY. We find ourselves 'hurrying' their lives so to speak with the quick graduation of pacificers, bottles, potty-training,preschool, etc. with the hope of them becoming more self-sufficient only to inadvertently (back door selfishness) lessen our load. I'm hoping this is just separation anxiety and will soon pass as you move into the next phase of your life. I know when my youngest was about to leave primary school I realised it was a rite of passage for me too. I would no longer be a parent at that school just round the corner. I wouldn't meet all those other parents every day, go on the trips, be involved whenever and wherever. Would I even be able to get up in the mornings??? In spite of my anxieties, about a week after he started 2ndary school I slotted straight into my new role and could appreciate the extra time it gave me. Well, what can I say... you have made *me* misty-eyed and I don't even have kids. However, like you, I always really enjoyed Christmas in all its familial glory, so to speak. Only last week I curled up in bed with a gigantic hot chocolate with cream and my fresh copy of The Polar Express. It is still the most wonderful time of the year for me and the magical memories will live forever. I am pretty sure that those little darlings in bed still hear the bells ringing and will do so for many years to come. By the sound of it, so will you. I love Christmas too, but it often seems to have some kind of sweet sadness buried in it somewhere. I think maybe because it can be an assesing time - you remember more sharply the people you miss and sometimes the bits of yourself you miss too. Here's to more tinsel and a bigger whisky and a very happy and interesting new year to you. Aw thanks for commenting, guys, and it's clear you all understand. Though it's not a bad thing, going nowhere - in fact, I rather think I might end up doing more exploring by not leaving than if I went off traveling right now. If that makes any sense.